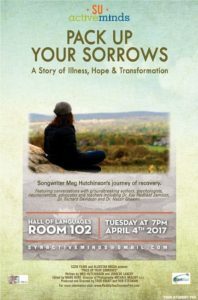 Join Active Minds, Syracuse’s mental health awareness and advocacy group, for the screening of Pack Up Your Sorrows, a documentary that follows singer-songwriter Meg Hutchinson as she struggles to live with and overcome mental illness. One of the producers of the documentary, Todd Kwait, will be video conferencing in after the screening for a question and answer session. This event will be held on Tuesday, April 4th, from 7-9 p.m. in Hall of Languages 102.